The town of Great Dunmow can be found in north west Essex, between Bishop's Stortford and Chelmsford, near Stansted Airport and the M11 motorway. Our museum was opened in 2001 and is located in the town centre. The museum records not only aspects of the social history and economic development of Dunmow and the surrounding area, but much that is the shared heritage of us all. 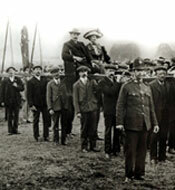 The pageant and "living history" of the Trials is re-enacted every Leap Year. Its origins are rooted in history but the intention was to reaffirm the Christian values of marriage. Both William Langland and Chaucer mention the Dunmow Flitch with no need for explanation, so even in the late 1300s it was a well-known part of national culture. Since Harrison Ainsworth revived the Flitch Trials in 1855, we have continued to celebrate happy marriages with not only a good deal of amusement, but also due regard to the custom. The museum has found a home in this rare example of a small, timber-framed maltings, much of which dates from the 16th century. Until its closure in the 1940s, malt was still made for the Dunmow Brewery opposite Doctor's Pond by the traditional method of turning barley by hand.